Indian food is definitely an acquired taste, one I’m very glad I have become accustomed to. I find myself craving the exotic, warm flavors, tender meat and the garlicky, doughy naan. Oh, THE NAAN! Saffron Indian Cuisine is nicer than I anticipated, with a black and white tile floor, an orange accented wall and no sign of a grocery store in the back. The lack of carpet makes for a loud atmosphere, but my dining partner and I quite enjoyed our evening. Except for one little problem. When you think Indian food, you think lamb. It’s the most tender, succulent, flavorful preparation of the meat I’ve ever had. Unfortunately, my fantasies of sinking my teeth into a tender hunk of the meat was brought to a startling halt when our server announced that they were OUT. Come again? It’s as if McDonald’s told me they were out of McNugs. How can an Indian restaurant be out of lamb at 7:30pm on a Saturday? Perplexed, my dining partner and I regrouped and perused the menu a bit longer. The Assorted Vegetarian Platter is a fun way to try a lot of different items to see what you like. Particularly with foreign cuisine, this is a safe way to introduce your taste buds to new flavors, in small portions. Samosas are scrumptious pastries with a curry potato filling, almost like an egg roll. Aloo Tikki are thin potato croquettes, and Cheese Pakora are fritters, with notes of chickpea and corn flours. My favorite on the platter were the Vegetable Paloras - deep-fried veggies, almost tempura-style. The tastiest veggie? Cauliflower! Totally not what I was expecting. The Mint and Tamarind Chutneys that accompanied the platter were wonderful and essential; the mint variety is cool and refreshing, featuring notes of cilantro, versus the Tamarind Chutney’s tangy and syrupy essence. 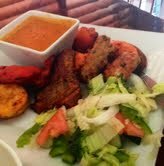 Still a little thrown from our denial of lamb, we decided the Tandoori Mixed Grill would suffice as a second course. Chicken Tikka features tender chicken on skewers that has been cooked in the famous tandoor clay oven. Similarly, the Tandoori Chicken is prepared with just a slightly different marinade. The Tomato Cream sauce that’s served alongside is to die for. The Basmati Rice with toasted coconut is just asking to be drowned in this sauce and ladled into my mouth. The Seekh Kebab is definitely for meat lovers, looking and tasting like sausage. Two Tandoori Shrimp are plump and juicy – I could have used a few more of those. We decided that we needed one more dish to round out our feast. Nargisi Kofta was kind of a blind order. Grated vegetable dumplings are steamed and served in a velvety, yellow sauce, garnished with dried fruits. The word “fruit” intrigued us, though it only imparted a slightly sweet flavor. These were pretty good, but not great. We hated to waste what seemed like a gallon of sauce for the 5 little dumplings. The servers must have thought we were crazy for not lapping it up with Naan. Or our spoons. Besides consoling us for the lack of lamb, the servers were incredibly attentive with the water refills, which were necessary to cleanse our palates from all the savory flavors. I need to return to sample their lamb dishes, but otherwise, I was pretty satisfied with my experience. If you’re a curry or Indian food virgin, ye shan’t be afraid! Go with an experienced diner, and you’ll be a convert by the end. The more you experiment, the more you’ll fall in love with it. Hi! I found your blog on Nico's restaurant page. Sadly I have never been to Nico's and they are now closed! I have been to saffron as well! It is very delicious. You should check them out during lunch buffet. It is a reasonable price as well as a great way to try multiple different dishes. Thanks for writing I will definitely be following your blog. Hi Katie! Thanks so much for your comment and the lunch buffet recommendation! I will definitely try it. I loved my experience at Saffron. Send any other recommendations you have! Thanks again!